I believe that we left the best for last. Even though the Society Islands is much more touristy and populated. These Islands are without a doubt absolutely beautiful. The easiest way to explain the Islands would be to say If you put the Marquesas’s beautiful mountains and the Tuamotu’s reefs and clear blue waters together you get the Society Islands. The Society Islands consists of 14 Islands. Although only 6 of the Islands are commonly visited by yachts. These Islands all have steep lush interiors with a fringing reef surrounding them. Our arrival into Tahiti the ‘big smoke’ was late afternoon on Saturday the 9th August. After the Islands on route across the Pacific, The Gambiers, The Marquesas, and The Tuamotu’s life seemed extremely busy there. The sound of sirens was the most noticeable sound from the marina. However it was nice to be where you could get all your conveniences again. A trip to the Carrefour was a treat after the little supermarkets I had been dealing with since leaving Chile. The view from Tahiti looking across at Moorea at Sunset. There isn’t many beaches in Tahiti and the most common ones that can be accessed is with black sand. The one main road that runs around the exterior of the Island is fairly monotonous but it does provide some stunning views. 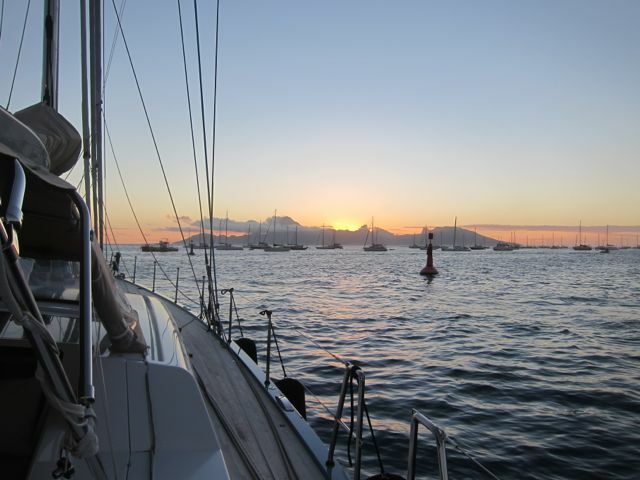 Without a doubt the best view from Tahiti was at sunset from the Marina looking out at Moorea. 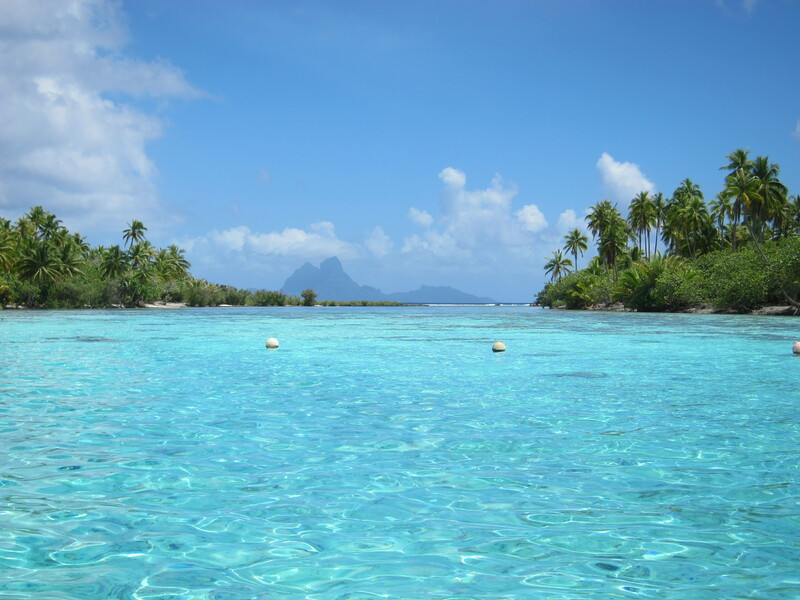 Louise had a 6 week stay in Tahiti and in the middle of that time we took a two week leave to explore a few of the Society Islands by land, which is something we rarely get to do when on the boat. 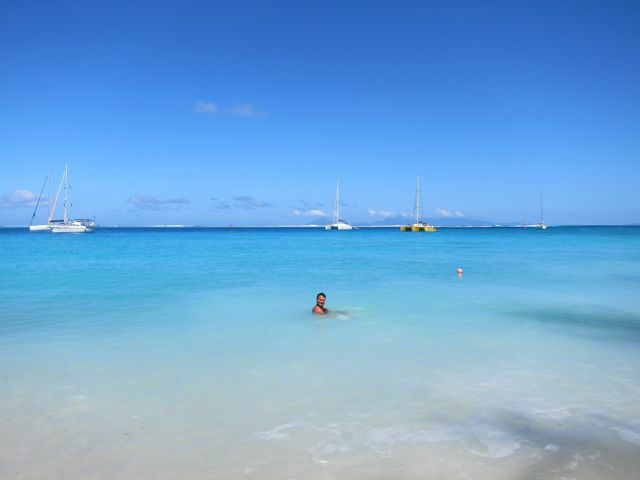 It was fun to see the islands from a different perspective and to enjoy the laid back lifestyle at a leisurely pace. We flew from Tahiti to Huahine, Raiatea , Bora Bora and then on to Moorea before returning to Tahiti. We stayed 3-4 nights in each location doing most of our exploration by bicycle. It was a fun two weeks. On Monday the 22nd September we started a cruise around the islands. 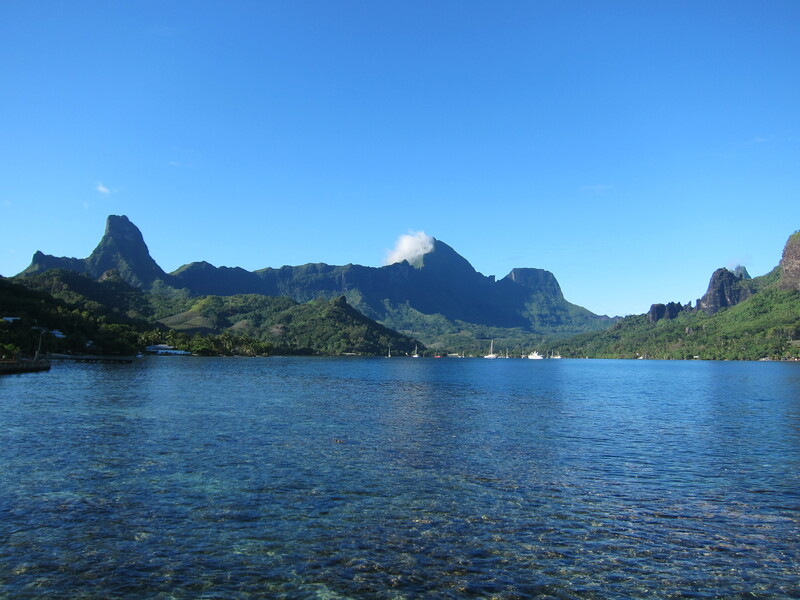 We left Tahiti and made the short trip across to beautiful Moorea. On route we were lucky to have several whale sightings. Unfortunately they were too far away for a close encounter. Moorea by far is one of my favorite islands of the Society group. It’s mountains stands tall and a vibrant green. The bays are the deepest of blues. Being just a few miles from Tahiti Moorea is probably the most visited of the islands, although this doesn’t seem to affect its charm. The beautiful beach in Huahine. From there we sailed the full day passage across to Huahine. Low key Huahine is blessed with a cute little town and a beautiful beach just of it. Tourism isn’t that plentiful here but this is what makes this gem so unique. From Huahine all the other Islands in the group could be seen. Bora Bora as seen from the Coral Gardens in Tahaa. Tahaa provided a spectacular view across the passage to Bora Bora. 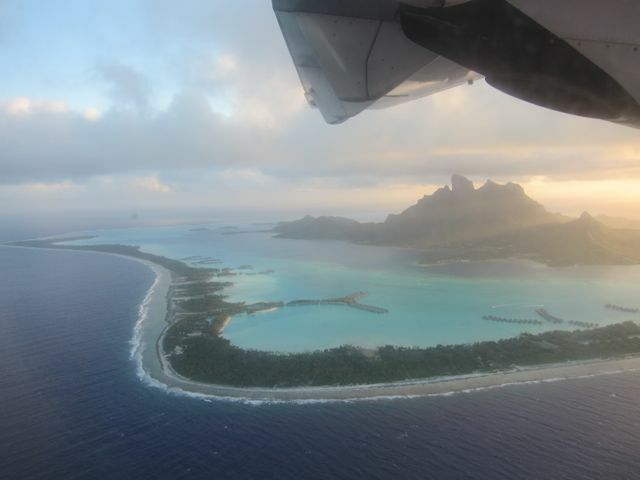 The view of Bora Bora from the Air. Then there was Bora Bora. Without a doubt one of the most sort after honeymoon destinations in the world. We have to admit that from the air the magnificent view of the Lagoon and the island makes it pretty special. The Island itself doesn’t have a great deal to offer unless you are paying the big bucks at one of the top resorts. However the azure waters make this a spectacular spot. In all of the Islands good beaches are few and far between. 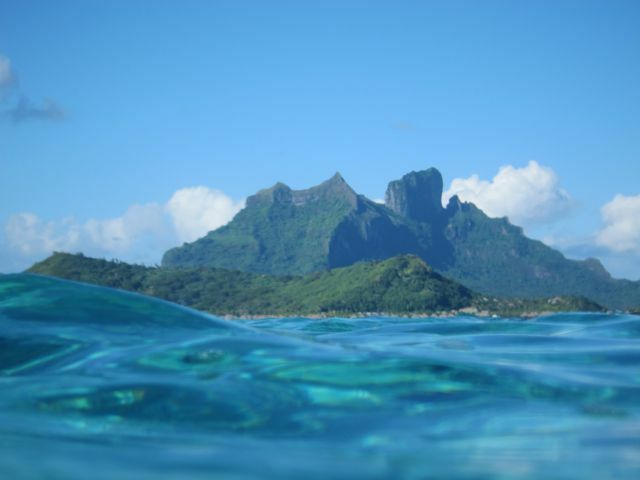 Its the clear blue waters, stunning motu’s and Polynesian charm that makes them shine. At the end of the two weeks we made our way over to Raiatea and started to prepare Louise for the second half of her Pacific trip. We had enjoyed the Society Islands with all they had to offer.